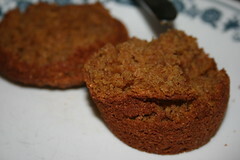 Bran muffins are not usually the kind of thing that excites me in the least, but these muffins, with seasonal spices and a hint of pumpkin, are quite nice. I wonder if you could replace the pumpkin with additional okara for a straight-up bran muffin -- it seems like you could, but I haven't tried it to see how it would affect taste and texture. Maybe worth a little experimentation if you're ever in dire need of extra fiber. 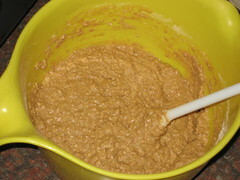 and stir until ingredients are well incorporated. 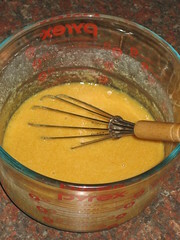 and whisk until ingredients are combined and oil is emulsified. 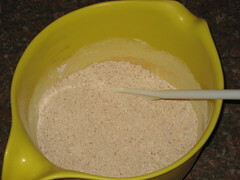 Pour the wet ingredients into the dry ingredients and stir until just mixed. 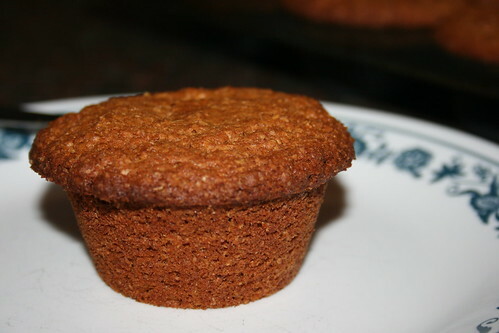 Fill the wells of a lightly oiled 12-muffin pan and bake at 400 degrees Fahrenheit for 27 minutes.